The flowers are putting on a wonderful display in the garden this Summer. But some of my terracotta pots are looking a little less than presentable. So you guessed it, I have had the paint pots and paint brush out again. Ready to paint my clay terracotta garden pots. No need for primer this time, just two coats of paint. If your terracotta pots are destined for the garden and subject to the weather, they are likely to need a refresher coat the following year. I love the colours, along with how fabulous they look. For those interested in the plants, they are both herbs - a Strawberry Mint and a Pineapple Sage. If you could only smell their delicious scent when you touch or crush the leaves. These two herb plants in their posh new pots are destined for another garden. A birthday gift for a friend and her wonderful new garden. 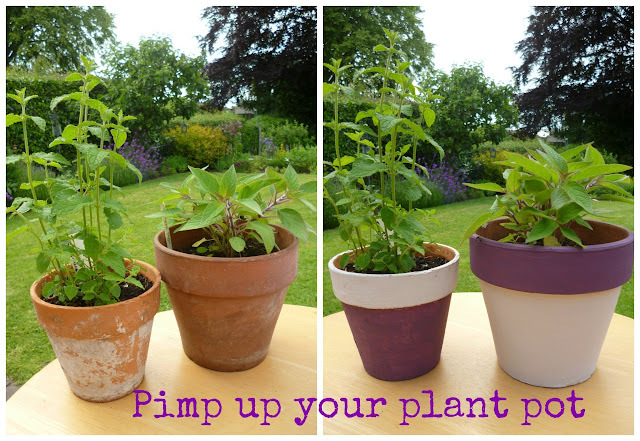 What a great idea to spruce up some plastic pots, even better when they were given to you! You will need to lightly sand the pots and paint a primer to them before using an emulsion paint. Check the instructions on the primer that it is suitable for use on plastic. You can also get some great spray paints and primer, but I've yet to give them a try. Hope the upcyling goes well, do let me know how they turn out. The terracotta pots look much better with the new paint. It's an easy way to bring some colour in the garden and take advantage of the things you already have. Well done.